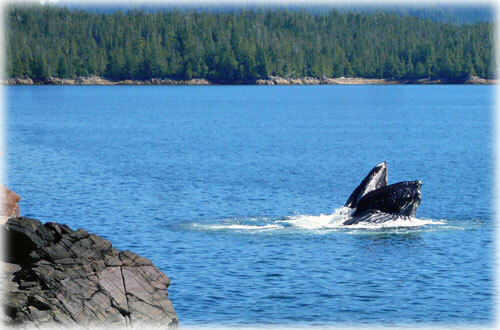 This humpback bubble feeding in the Herring Cove area was photographed by 12-year-old Dillon Coville. Ketchikan: Salvage operations ready to begin recovery of cable – The Mexus Gold US tug, "Caleb" has now arrived in Ketchikan, Alaska ready to commence salvage operations for the recovery of cable, which contains a significant amount of copper. Fish Factor: How is Alaska's seafood faring? By LAINE WELCH - Fishing occurs far away from where the catches end up, namely, retail counters and restaurants, and it is fun to get a feel for how Alaska’s seafood is faring. The Alaska salmon brand is a top seller at the nation’s biggest supermarkets and it has dominated all promotions this summer. An analysis of U.S. seafood sales by Seafood.com showed that salmon was identified by species or by the word "Alaska" in 70% of all retail promotions in July. Salmon represented 21% of all seafood promotions, second only to shrimp at 32%. In raw numbers, U.S. retailers ran 266 salmon promotions in July, compared to 405 shrimp promotions. Sockeye dominated the hype, garnering 42% of all salmon promotions during the month, and selling for an average retail price of $9.99/lb. “No other seafood commodities had nearly the same level of promotional activity as salmon and shrimp,” said John Sackton, Seafood.com editor. Alaska wild salmon has clearly differentiated itself in a world that is mostly awash in farmed fish. “Farmed salmon is the box wine of fish and wild Alaska salmon is like the fine varietals,” has long claimed restaurateur Roger Berkowitz of Legal Seafoods fame. Still, farmed Atlantic salmon is the single largest source for the mid consumer level in global markets - and absent from the picture for four years has been Chile, the world’s second biggest producer after Norway. A deadly fish virus collapsed Chilean production four years ago, but the industry is on its way to recovery. 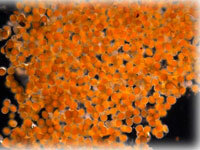 Alaska: Lab determines mysterious orange goo is mass of microscopic eggs - Scientists at the NOAA Alaska Fisheries Science Center’s Auke Bay Laboratories have determined the mysterious orange substance that washed ashore last week near the village of Kivalina is microscopic eggs. Rice and a team of NOAA biologists and chemists received a sample of the orange matter early Saturday. Their first task was to determine if it was “animal, vegetable, or mineral,” said Rice. That basic question was easily answered once scientists viewed the substance under a high-powered microscope. Ketchikan: July's rainfall in Ketchikan twice expected amount – Ketchikan's monthly precipitation in July was measured at 11.94 inches, nearly twice the expected amount. Remarkable was the precipitation recorded on July 1. A whopping 3.69 inches set a new record for the date. The precipitation surpasses the old record by about one-third, which was set in 1917 at 2.49 inches. BOB CIMINEL: Idiot on Board? - I was driving home the other day when an SUV blew by me like I was standing still. I know that doesn’t sound unusual, but the car had one of those yellow “Baby on Board” stickers on the tailgate. I thought the baby was driving. I followed the SUV at a safe distance because it was driving quite erratically, weaving in and out of traffic, speeding up and slowing down, and being generally unsafe. I was directly behind the car when the driver made a right-on-red without checking for oncoming traffic. No, the baby wasn’t driving, an idiot was. Another problem with Baby-on-Board stickers is you have to get very close to read them. And that means you have to tailgate. Tailgating can lead to a rear-end collision, which certainly isn’t good for the baby on board.